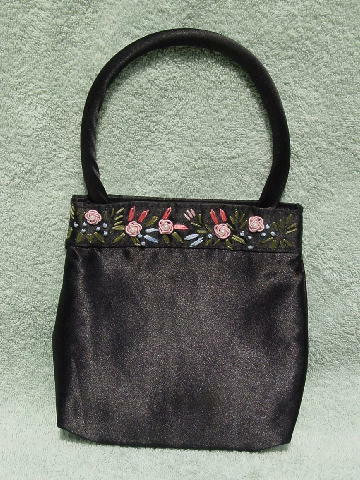 This black 100% polyester purse was made in India. It has a black fabric lining and a magnetic snap closure on the interior rim. There is a 12" long solid fabric covered handle. It has a 1 1/8" wide panel which has an embroidered leaf and flower design in pink, blue, and olive green on the front. There are 5 faux pearls in the center of each pink flower.